Family, the various branches of which claim a common Kohenitic origin. The names of Rapa or Rappe ha-Kohen ( ) are met with about 1450. At that time Meshullam Kusi (abbreviated from "Jekuthiel") Rapa ha-KohenẒedeḳ, the earliest known member of the family, lived on the Rhine, probably in Mayence. Several decades later the family disappeared from Germany, probably on account of the expulsion of the Jews from Mayence Oct. 29, 1462. In 1467, in Mestre, near Venice, the wealthy Ḥayyim Rappe is found as collector of alms for the poor of the Holy Land. In Venice the physician R. Moses Rap was exempted in 1475 from wearing the Jew's badge. The Polish branch of the family explains its name through the following legend: One Easter a certain Jew, to prevent his enemies from smuggling thebody of a Christian child into his house, closed all possible entrances and openings except the chimney. Down the chimney, however, the dreaded corpse fell, but when a crowd stormed the house nothing but a partridge (Old German, "Rephuhn" or "Raphuhn") was found in the fireplace. 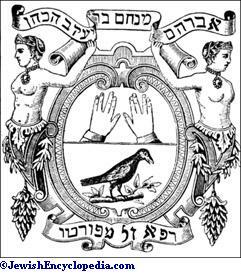 But the "Von den Jungen Raben" in the signature of Abraham Menahem ha-Kohen Rapa von Port (see Rapa, Menahem Abraham b. Jacob ha-Kohen) at the end of his Pentateuch commentary, and the additional fact that the coat of arms of the family bears two ravens, clearly show that signifies "Rabe" (Middle High German, "Rappe"). The family name, therefore, at the end of the sixteenth century seems to be clearly established as Ha-Kohen Rabe. In the middle of the sixteenth century there appears in Italy a Kohenitic family of the name of Porto. On March 18, 1540, R. Isaac Porto ha-Kohen obtained from the Duke of Mantua permission to build a synagogue (Ashkenazic). The name of the family is to be derived neither from Oporto (Portugal) nor from Fürth (Bavaria), but from Porto, near Mantua, where undoubtedly the above-named Isaac Porto ha-Kohen lived. An alliance between the Rabe and Porto families explains the combination of the two family names in Rapoport; indeed, in 1565, officiating in the above-mentioned synagogue of Mantua, there is found a Rabbi Solomon b. Menahem ha-Kohen Rapa of Venice, while a Rabbi Abraham Porto ha-Kohen (1541-76) was parnas of the community. See Rapa. However this may be, in the middle of the seventeenth century authors belonging to the Rapa-Port family were living in Poland and Lithuania, the name having meanwhile undergone the following modifications: Rapiport, Rapoport, Rapperport, and Rappert. The family spread principally from Cracow and Lemberg; in the latter place, in 1584, was born the famous Talmudist Abraham Rapa von Port (called also Schrenzel). In 1650 Rapoports lived in Dubno and Krzemeniec; in the eighteenth century descendants of R. Judah Rapoport are found in Smyrna and Jerusalem. 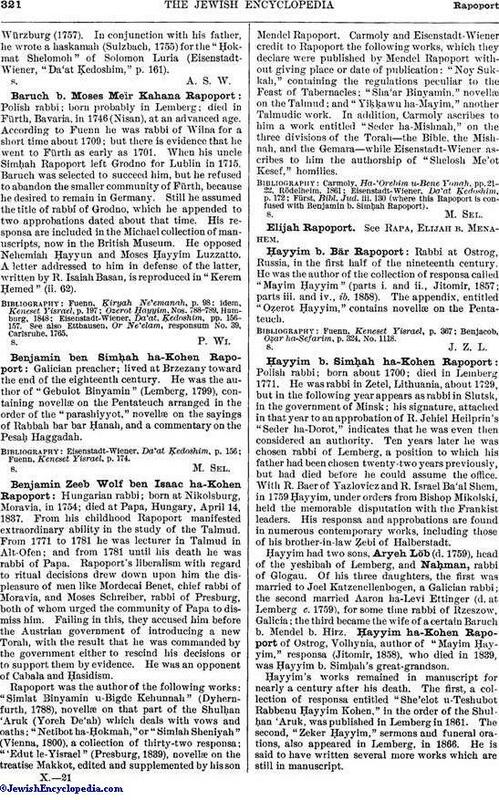 About 1750 there were two Rapoports in Dyhernfurth (Silesia)—one named Israel Moses and the other R. Meïr: the former came from Pinczow, the latter from Krotoschin. Both found employment in the printing establishment at Dyhernfurth. Arms of the Rapoport Family. The sons of the Rapoport of Krotoschin who settled in Breslau and Liegnitz adopted, in 1818, the name of Warschauer. During the last 450 years members of the family have been found in eighty different cities of Europe and Asia. Polish Talmudist; born at Lemberg in 1584; died in 1651 (June 7); son of R. Israel Jelriel Rapoport of Cracow and son-in-law of R. Mordecai Schrenzel of Lemberg. 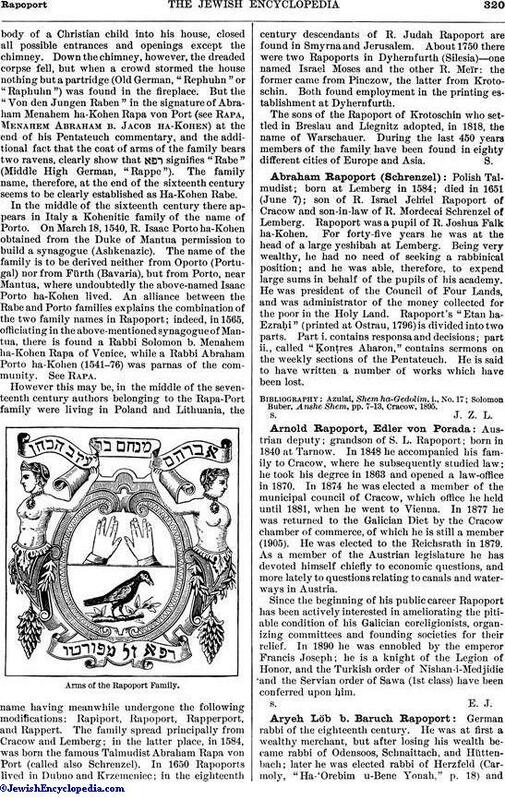 Rapoport was a pupil of R. Joshua Falk ha-Kohen. For forty-five years he was at the head of a large yeshibah at Lemberg. Being very wealthy, he had no need of seeking a rabbinical position; and he was able, therefore, to expend large sums in behalf of the pupils of his academy. He was president of the Council of Four Lands, and was administrator of the money collected for the poor in the Holy Land. Rapoport's "Etan ha-Ezraḥi" (printed at Ostrau, 1796) is divided into two parts. Part i. contains responsa and decisions; part ii., called "Ḳonṭres Aharon," contains sermons on the weekly sections of the Pentateuch. He is said to have written a number of works which have been lost. Solomon Buber, Anshe Shem, pp. 7-13, Cracow, 1895. Austrian deputy; grandson of S. L. Rapoport; born in 1840 at Tarnow. In 1848 he accompanied his family to Cracow, where he subsequently studied law; he took his degree in 1863 and opened a law-office in 1870. In 1874 he was elected a member of the municipal council of Cracow, which office he held until 1881, when he went to Vienna. In 1877 he was returned to the Galician Diet by the Cracow chamber of commerce, of which he is still a member (1905). He was elected to the Reichsrath in 1879. As a member of the Austrian legislature he has devoted himself chiefly to economic questions, and more lately to questions relating to canals and water-ways in Austria. Since the beginning of his public career Rapoport has been actively interested in ameliorating the pitiable condition of his Galician coreligionists, organizing committees and founding societies for their relief. In 1890 he was ennobled by the emperor Francis Joseph; he is a knight of the Legion of Honor, and the Turkish order of Nishan-i-Medjidie and the Servian order of Sawa (1st class) have been conferred upon him. German rabbi of the eighteenth century. He was at first a wealthy merchant, but after losing his wealth became rabbi of Odensoos, Schnaittach, and Hüttenbach; later he was elected rabbi of Herzfeld (Carmoly, "Ha-'Orebim u-Bene Yonah," p. 18) andWürzburg (1757). In conjunction with his father, he wrote a haskamah (Sulzbach, 1755) for the "Ḥokmat Shelomoh" of Solomon Luria (Eisenstadt-Wiener, "Da'at Ḳedoshim," p. 161). Polish rabbi; born probably in Lemberg; died in Fürth, Bavaria, in 1746 (Nisan), at an advanced age. According to Fuenn he was rabbi of Wilna for a short time about 1709; but there is evidence that he went to Fürth as early as 1701. When his uncle Simḥah Rapoport left Grodno for Lublin in 1715, Baruch was selected to succeed him, but he refused to abandon the smaller community of Fürth, because he desired to remain in Germany. Still he assumed the title of rabbi of Grodno, which he appended to two approbations dated about that time. His responsa are included in the Michael collection of manuscripts, now in the British Museum. He opposed Nehemiah Ḥayyun and Moses Ḥayyim Luzzatto. A letter addressed to him in defense of the latter, written by R. Isaiah Basan, is reproduced in "Kerem Ḥemed" (ii. 62). Eiseustadt-Wiener, Da'at, Ḳedoshim, pp. 156-157. See also Etthausen, Or Ne'elam, responsum No. 39, Carlsruhe, 1765. Galician preacher; lived at Brzezany toward the end of the eighteenth century. He was the author of "Gebulot Binyamin" (Lemberg, 1799), containing novellæ on the Pentateuch arranged in the order of the "parashiyyot," novellæ on the sayings of Rabbah bar bar Ḥanah, and a commentary on the Pesaḥ Haggadah. Fuenn, Keneset Yisrael, p. 174. Hungarian rabbi; born at Nikolsburg, Moravia, in 1754; died at Papa, Hungary, April 14, 1837. From his childhood Rapoport manifested extraordinary ability in the study of the Talmud. From 1771 to 1781 he was lecturer in Talmud in Alt-Ofen; and from 1781 until his death he was rabbi of Papa. Rapoport's liberalism with regard to ritual decisions drew down upon him the displeasure of men like Mordecai Benet, chief rabbi of Moravia, and Moses Schreiber, rabbi of Presburg, both of whom urged the community of Papa to dismiss him. Failing in this, they accused him before the Austrian government of introducing a new Torah, with the result that he was commanded by the government either to rescind his decisions or to support them by evidence. He was an opponent of Cabala and Ḥasidism. Rapoport was the author of the following works: "Simlat Binyamin u-Bigde Kehunnah" (Dyhernfurth, 1788), novellæ on that part of the Shulḥan 'Aruk (Yoreh De'ah) which deals with vows and oaths; "Netibot ha-Ḥokmah," or "Simlah Sheniyah" (Vienna, 1800), a collection of thirty-two responsa; "'Edut le-Yisrael" (Presburg, 1839), novellæ on the treatise Makkot, edited and supplemented by his son Mendel Rapoport. Carmoly and Eisenstadt-Wiener credit to Rapoport the following works, which they declare were published by Mendel Rapoport without giving place or date of publication: "Noy Sukkah," containing the regulations peculiar to the Feast of Tabernacles; "Sha'ar Binyamin," novellæ on the Talmud; and "Yiḳḳawu ha-Mayim," another Talmudic work. In addition, Carmoly ascribes to him a work entitled "Seder ha-Mishnah," on the three divisions of the Torah-the Bible, the Mishnah, and the Gemara—while Eisenstadt-Wiener ascribes to him the authorship of "Shelosh Me'ot Kesef," homilies. Fürst, Bibl. Jud. iii. 130 (where this Rapoport is confused with Benjamin b. Simḥah Rapoport). Rabbi at Ostrog, Russia, in the first half of the nineteenth century. He was the author of the collection of responsa called "Mayim Ḥayyim" (parts i. and ii., Jitomir, 1857; parts iii. and iv., ib. 1858). The appendix, entitled "Oẓerot Ḥayyim," contains novellæ on the Pentateuch. Benjacob, Oẓar ha-Sefarim, p. 324, No. 1118. Polish rabbi, born about 1700; died in Lemberg 1771. He was rabbi in Zetel, Lithuania, about 1729, but in the following year appears as rabbi in Slutsk, in the government of Minsk; his signature, attached in that year to an approbation of R. Jehiel Heilprin's "Seder ha-Dorot," indicates that he was even then considered an authority. Ten years later he was chosen rabbi of Lemberg, a position to which his father had been chosen twenty-two years previously, but had died before he could assume the office. With R. Baer of Yazlovicz and R. Israel Ba'al Shem, in 1759 Ḥayyim, under orders from, Bishop Mikolski, held the memorable disputation with the Frankist leaders. His responsa and approbations are found in numerous contemporary works, including those of his brother-in-law Ẓebi of Halberstadt. Ḥayyim had two sons, Aryeh Löb (d. 1759), head of the yeshibah of Lemberg, and Naḥman, rabbi of Glogau. Of his three daughters, the first was married to Joel Katzenellenbogen, a Galician rabbi; the second married Aaron ha-Levi Ettinger (d. at Lemberg c. 1759), for some time rabbi of Rzeszow, Galicia; the third became the wife of a certain Baruch b. Mendel b. Hirz. Ḥayyim ha-Kohen Rapoport of Ostrog, Volhynia, author of "Mayim Ḥayyim," responsa (Jitomir, 1858), who died in 1839, was Ḥayyim b. Simḥah's great-grandson. Ḥayyim's works remained in manuscript for nearly a century after his death. The first, a collection of responsa entitled "She'elot u-Teshubot Rabbenu Ḥayyim Kohen," in the order of the Shulḥan 'Aruk, was publisḥed in Lemberg in 1861. The second, "Zeker Ḥayyim," sermons and funeral orations, also appeared in Lemberg, in 1866. He is said to have written several more works which are still in manuscript. Buber, Anshe Shem, pp. 69-72. Cracow, 1895. Palestinian rabbi of the eighteenth century; born and died at Jerusalem, a pupil of R. Hezekiah da Silva. After a journey to Europe in behalf of the ḥaluḳḳah fund, he was elected rabbi of Smyrna, where he remained forty years. At an advanced age he returned to Jerusalem, where he was appointed to a rabbinate. He was the author of a work entitled "Batte Kehunnah." The first part contains responsa and treatises on the poseḳim (Smyrna, 1741); the second part consists of sermons, together with studies on the Talmud (Salonica, 1744). Fürst, Bibliotheca Judaica, iii. 130-131. Russian communal leader; born 1802; died in Minsk March 7, 1872; son of Ḥayyim ha-Kohen, rabbi of Ostrog, Volhynia (d. 1839), and great-grandson of R. Ḥayyim ha-kohen Rapoport of Slutsk and Lemberg. He married into a wealthy family of Minsk, where he settled. His extensive Talmudic knowledge and his piety did not prevent him from sympathizing with the progressive movement for the spread of secular knowledge among the Jews of Russia, and he encouraged Dr. Lilienthal, who visited Minsk on his tour through Russia in 1842. In 1856 he was chosen a member of the rabbinical commission which met the following year in St. Petersburg to discuss Jewish affairs. He and his brother Jacob, rabbi of Ostrog, published their father's "Mayim Ḥayyim" (Jitomir, 1857-58). Jekuthiel left two sons, Jacob of Warsaw and Wolf of Minsk (d. 1898), and three daughters, one of whom married Israel Meisels, rabbi of Siedlce. Eisenstadt-Wiener, Da'at Ḳedoshim, pp. 174, 177, St. Petersburg, 1897-98. Austrian poet and physician; born at Lemberg Jan. 19, 1808; died at Vienna May, 28, 1880; cousin of Solomon Judah Löb Rapoport. He received his early education at home; his father belonged to the party of Reform, while his mother was strongly Orthodox. The period from 1822 to 1832 Rappaport spent in Vienna, attending the gymnasium of the Benedictine monks and studying medicine at the university (M.D. 1832). Immediately after graduating he established himself as a physician in his native town. For forty years he was one of the leading physicians of Lemberg, where he was appointed chief physician at the Jewish hospital. 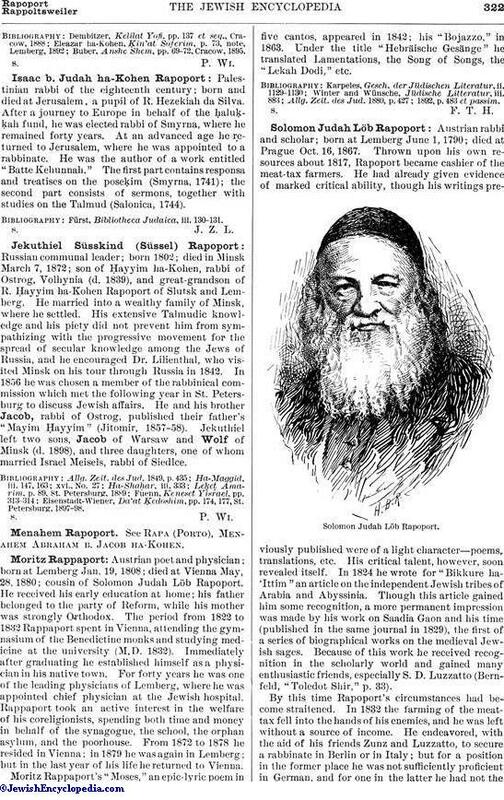 Rappaport took an active interest in the welfare of his coreligionists, spending both time and money in behalf of the synagogue, the school, the orphan asylum, and the poorhouse. From 1872 to 1878 he resided in Vienna; in 1879 he was again in Lemberg; but in the last year of his life he returned to Vienna. Moritz Rappaport's "Moses," an epic-lyric poem in five cantos, appeared in 1842; his "Bojazzo," in 1863. Under the title "Hebräische Gesänge" he translated Lamentations, the Song of Songs, the "Lekah Dodi," etc. Allg. Zeit. des Jud. 1880, p. 427; 1892, p. 483 et passim. 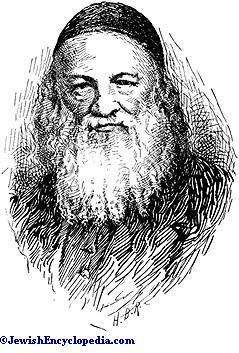 Austrian rabbi and scholar; born at Lemberg June 1, 1790; died at Prague Oct. 16, 1867. Thrown upon his own resources about 1817, Rapoport became cashier of the meat-tax farmers. He had already given evidence of marked critical ability, though his writings previously published were of a light character—poems, translations, etc. His critical talent, however, soon revealed itself. In 1824 he wrote for "Bikkure ha'Ittim" an article on the independent Jewish tribes of Arabia and Abyssinia. Though this article gained him some recognition, a more permanent impression was made by his work on Saadia Gaon and his time (published in the same journal in 1829), the first of a series of biographical works on the medieval Jewish sages. Because of this work he received recognition in the scholarly world and gained many enthusiastic friends, especially S. D. Luzzatto (Bernfeld, "Toledot Shir," p. 33). By this time Rapoport's circumstances had become straitened. In 1832 the farming of the meat-tax fell into the hands of his enemies, and he was left without a source of income. He endeavored, with the aid of his friends Zunz and Luzzatto, to secure a rabbinate in Berlin or in Italy; but for a position in the former place he was not sufficiently proficient in German, and for one in the latter he had not therequired university diploma. The intellectual Jews of Brody, therefore, established a business and made Rapoport its superintendent ("Iggerot Shir," p. 259). In 1837 he was appointed, through the endeavors of J. Perl and other Maskilim, rabbi of Tarnopol ("Kerem Ḥemed," iv. 241 et seq. ), and in 1840 rabbi of Prague. Rapoport was conservative in his religious views. His Orthodoxy was of the type of Zacharias Frankel's. 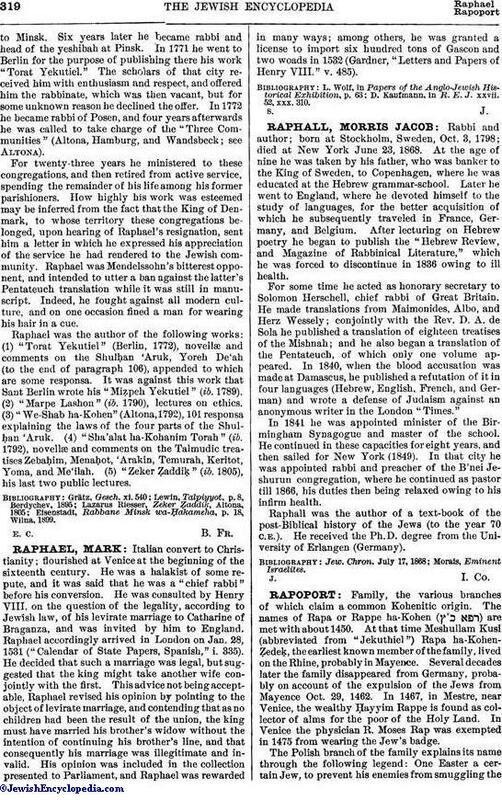 He wrote "Torah Or" against the radical views Geiger had expressed in his "Urschrift," rebuked Jost for taking the same attitude in his "Ṭokaḥat Megullah" (an open letter to the rabbis assembled at Frankfort-on-the-Main in 1845, published with a German translation by Raphael Kirchheim, Frankfort-on-the-Main, 1846; see p. 1), and assumed a negative attitude toward the convention of German rabbis at Frankfort-on-the-Main in 1845. Rapoport was chiefly distinguished as a critical investigator. As such he was preceded by Zunz, Jost, and Krochmal, though in his researches he was independent of them. He differs from the first two in that he is deeper and more thoroughgoing in his researches, and from Krochmal in that his investigations are more minute and detailed. It was in virtue of this excellence that Rapoport succeeded, in most of his investigations, in establishing historical dates. Thus he was the first to throw light on the life and period of Saadia Gaon ("Toledot Shir." p. 33). He did similar service in connection with the biographies of R. Nathan (author of the "'Aruk"), Hai Gaon, Eleazar ha-Ḳalir ("Bikkure ha'Ittim," 1840-41), R. Hananeel, R. Nissim (ib. 1842), and others. 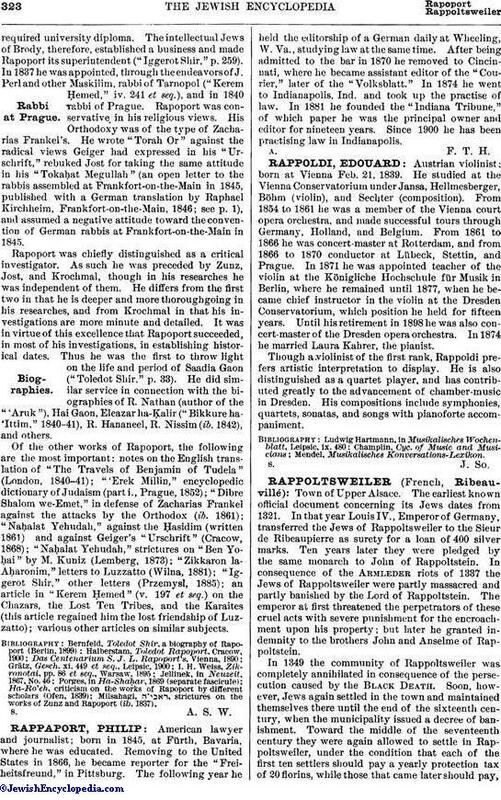 Of the other works of Rapoport, the following are the most important: notes on the English translation of "The Travels of Benjamin of Tudela" (London, 1840-41); "'Erek Millin," encyclopedic dictionary of Judaism (part i., Prague, 1852); "Dibre Shalom we-Emet," in defense of Zacharias Frankel against the attacks by the Orthodox (ib. 1861); "Naḥalat Yehudah," against the Ḥasidim (written 1861) and against Geiger's "Urschrift" (Cracow, 1868); "Naḥalat Yehudah," strictures on "Ben Yoḥai" by M. Kuniz (Lemberg, 1873); "Zikkaron la-Aḥaronim," letters to Luzzatto (Wilna, 1881); "Iggerot Shir," other letters (Przemysl, 1885); an article in "Kerem Ḥemed" (v. 197 et seq.) on the Chazars, the Lost Ten Tribes, and the Karaites (this article regained him the lost friendship of Luzzatto); various other articles on similar subjects. Milsahagi, , strictures on the works of Zunz and Rapoport (ib. 1837).